With less than two million people, Kosovo, which declared its independence from Serbia in 2008, is the home of over 800 mosques. Now the Islamic Community of Kosovo is building the “Central Mosque” at an estimated cost of $35 to $40 million. Turkey’s Directorate of Religious Affairs (the Diyanet) is financing the project. Die Linke politician Sevim Dagdelen asked the German government why it continues to enable the “scandalous” Saudi mission to proselytize Wahhabism in Kosovo, under the nose of the NATO-led Kosovo Force. Saudi Arabia is sending Wahhabi preachers to Kosovo in a bid to further radicalize the local population, the German government said on Wednesday. 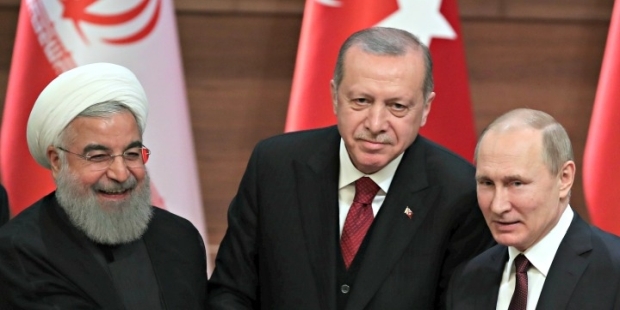 Answering a parliamentary question tabled by Sevim Dagdelen, a representative of Die Linke in the German Bundestag, the German government acknowledged the increasing influence of Wahhabism in Kosovo. Is Kosovo a breeding ground for Islamists? The two brothers arrested on suspicion of plotting a terrorist attack in Duisburg come from Kosovo. Their homeland has long been concerned with growing Islamic radicalism. Authorities are trying to counteract the trend. Almost 2 million people live in Kosovo. Since 2012, 316 people – including women and children – have left the country to join the so-called “Islamic State” terrorist militia. Of those 316 people, 58 have been killed and 117 have returned to Kosovo, said Baki Kelani, spokesman for Kosovo’s ministry of the interior. According to Kelani, 237 people are being investigated for planning and taking part in terrorist attacks outside Kosovo and also for recruiting, supporting and funding terrorists. Since 2013, 127 of the suspects have been arrested, including an alleged ringleader. Police in Kosovo said on Wednesday they had arrested 19 people in the past 10 days on suspicion of having links with Islamic State and planning to carry out attacks in Kosovo and in neighboring Albania. The police said the suspects were in contact with an Islamic State member, the self-declared “commander of Albanians in Syria and Iraq”, Lavdrim Muhaxheri, from whom they received orders to attack. Authorities in Kosovo said on July 25 that they have charged an Iranian man with “financing terrorism and money laundering” through a nongovernmental group he operates called the Qur’an Foundation of Kosova. The allegations against Hasan Azari Bejandi include charges that he laundered nearly $1 million in undeclared cash between 2014 and 2015. Bejandi also oversees the activities of four other Shi’ite religious organizations suspected of having links to Tehran. Hundreds of young Kosovar men and women are leaving their home country to join ISIS in Syria, leaving behind baffled parents. Kosovo parents have told how ‘a generation’ of their teenage daughters have been seduced by radical Islam, following their husbands to Syria and the terrorist organisation. 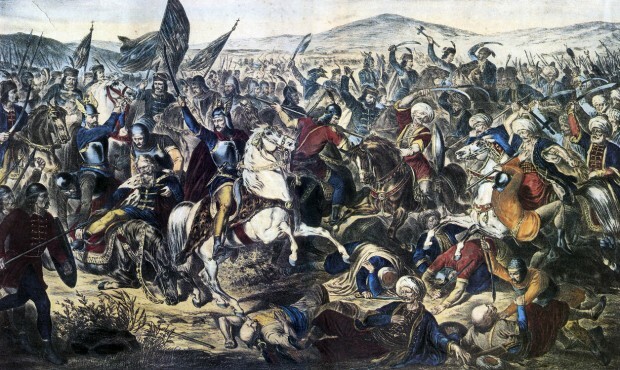 Albanians have always been intensely pro-American. Kosovars deeply appreciate the US-led NATO intervention in 1999, which put Kosovo on the path to independence. They are grateful to the US for coordinating Kosovo’s recognition by the international community. Given the strong affinity between Albanians and the United States, the recent rise of Islamism in Kosovo is deeply troubling. Approximately 95 percent of Kosovo’s two million inhabitants are ethnic Albanians. Of the Albanians, 97 percent are Muslim and 3 percent are Catholic. Kosovo was always a secular state with a liberal Muslim majority. However, Kosovo’s secular character is changing. Nestling in a wooded valley that its citizens laid their lives down to defend, the town of Kacanik in southern Kosovo is fiercely proud of its war dead. Well-kept cemeteries include nearly 100 victims of Serb-led ethnic cleansing in 1999, while in the town centre, a statue clutching an RPG honours fallen members of Brigade 162 of the Kosovan Liberation Army. But a decade and a half on from the war that brought about Kosovo’s independence, there is rather less pride in Kacanik’s new crop of warriors. Kosovo authorities say they have cut off the water supply to tens of thousands of people in the capital after police arrested five suspects linked to Islamic State who were allegedly planning to poison a reservoir. Pristina’s water authority said the water supply was shut off early on Saturday “because of security issues”, and that samples were being tested for suspicious substances. At least 232 Kosovo citizens are fighting alongside militants in Syria and Iraq, making Kosovo rank eighth overall (and first per capita) among the 22 Western states with citizens fighting in Syria and Iraq, a new report has found. The Kosovar Center for Security Studies (KCSS), a nonprofit think tank established in 2008 in Kosovo to research security issues, has found that, as of January 2015, there are 232 confirmed cases of Kosovo citizens fighting alongside militant groups in Syria and Iraq, including Islamic State (IS). The first Kosovo citizen to be killed fighting alongside opposition forces in Syria was a militant named Naman Demolli from Pristina, whose death was announced in a video uploaded to YouTube in November 2012. 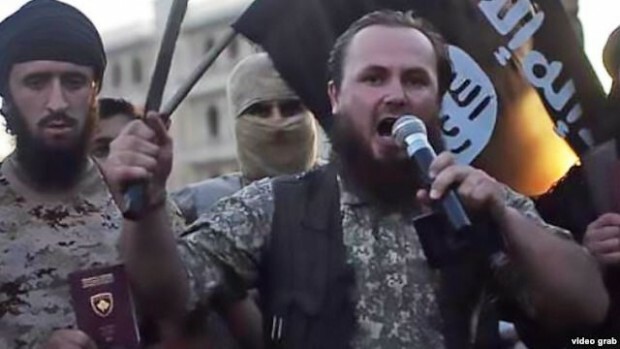 Ethnic Albanian Kosovar Lavdrim Muhaxheri (holding microphone) appears in an IS video calling on Albanian Muslims to join militants fighting against Syrian President Bashar al-Assad.